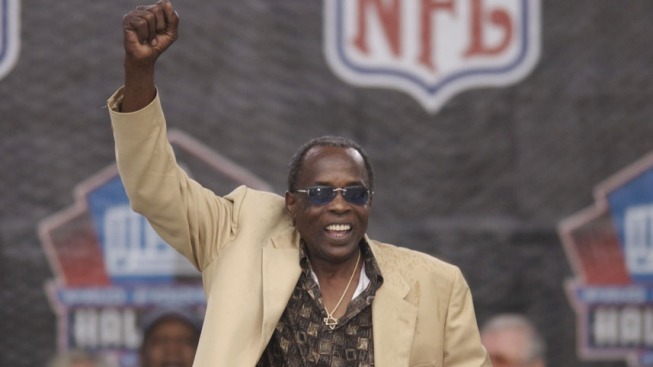 Hall-of-Fame defensive end and former Redskin David "Deacon" Jones passed away from natural causes Monday night. He was 74. Jones is credited with coining the term "sacking the quarterback," but while sacks didn't become an official statistic until 1982, his impact at the defensive end position cannot be quantified. Jones spent the first 10 years of his career (1961-71) playing for the Rams, where he was part of the "Fearsome Foursome" defensive line that included Larry Lundy, Rosey Grier and Merlin Olsen. He was traded to the San Diego Chargers in 1972 and spent two seasons there before finishing his career with a one-year stint with the Redskins. He was an eight-time Pro Bowler, including seven straight from 1964-70. He was also a two-time Defensive Player of the Year in 1967 and 1968 as well as a member of the NFL's 75th Anniversary All-Time Team. Jones was inducted into the Pro Football Hall of Fame by George Allen in 1980. Jones returned the favor by presenting Allen in 2002. A 14th-round draft pick in 1961 out of Mississippi Valley State, Jones was the CEO of his own foundation which is "committed to developing leaders...who understand their commitment to the inner-city communities from which they come, and have the tools and the desire to return...to give back of their knowledge; to help those less fortunate; to help stem the cycle of inner-city strife and continuous depreciation of neighborhoods [and] to be positive role models for others to emulate."